An undated photo of Murdoch, later published in accounts of the sinking of the Titanic. 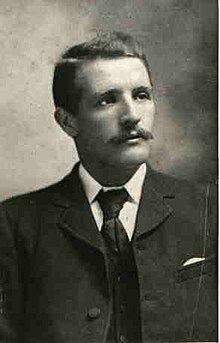 William McMaster Murdoch, RNR (28 February 1873 – 15 April 1912) was a Scottish sailor who served as First Officer aboard the RMS Titanic. He was notable as the officer in charge when the Titanic collided with an iceberg. Mystery also surrounds his death. Born from a family of sailors, William Murdoch was an officer of the Royal Naval Reserve; he was employed by the White Star Line in 1900 and quickly rose to the rank of officer. In 1903, his leadership became recognized when he avoided a collision with the Arabic. In April 1912, Murdoch served as First Officer aboard the RMS Titanic. He is notable as the officer in charge on the bridge the night the Titanic struck an iceberg in the Atlantic Ocean. He was one of 1,500 people who died in the disaster. Murdoch became an iconic Scottish hero, a status that is maintained and reflected by the memorial in his hometown of Dalbeattie. However, debate revolves around the adequacy of instructions given to avoid the iceberg. In the aftermath of the sinking, a number of eyewitness testimonies arose of a shooting/suicide by an officer during the launching of the last lifeboat. Though these facts are unconfirmed, it is possible that Murdoch was that officer. Murdoch has become a figure of controversy, with mystery surrounding the circumstances of his death and his actions during the collision with the iceberg. Murdoch was born in Dalbeattie in Kirkcudbrightshire (now Dumfries and Galloway), Scotland, the fourth son of Captain Samuel Murdoch, a master mariner, and Jane Muirhead, six of whose children survived infancy. They were a long and notable line of Scottish seafarers who sailed the world's oceans as early as the 19th century. His father and grandfather were both sea captains as were four of his grandfather's brothers. Murdoch was educated first at the old Primary School in High Street, and then at the Dalbeattie High School in Alpine Street until he gained his diploma in 1887. Finishing schooling, he followed in the family seafaring tradition and was apprenticed for five years to William Joyce & Coy, Liverpool, but after four years (and four voyages) he was so competent that he passed his second mate's Certificate on his first attempt. He served his apprenticeship aboard the Charles Cosworth of Liverpool, trading to the west coast of South America. From May 1895, he was First Mate on the St. Cuthbert, which sank in a hurricane off Uruguay in 1897. Murdoch gained his Extra Master's Certificate at Liverpool in 1896, at age 23. From 1897 to 1899, he was First Officer aboard the J. Joyce & Co. steel four-masted 2,534-ton barque Lydgate, that traded from New York to Shanghai. From 1900 to 1912, Murdoch gradually progressed from Second Officer to First Officer, serving on a successive number of White Star Line vessels, Medic (1900, along with Charles Lightoller, Titanic's second officer), Runic (1901–1903), Arabic (1903), Celtic (1904), Germanic (1904), Oceanic (1905), Cedric (1906), Adriatic (1907–1911) and Olympic (1911–1912). In 1903, Murdoch met a 29-year-old New Zealand school teacher named Ada Florence Banks en route to England on either the Runic or the Medic. They began to correspond regularly and on 2 September 1907 they were wed in Southampton at St Deny's Church. During 1903, Murdoch finally reached the stormy and glamorous North Atlantic run as Second Officer of the new liner Arabic. His cool head, quick thinking and professional judgement averted a disaster when a ship was spotted bearing down on the Arabic out of the darkness. He overrode a command from his superior, Officer Fox, to steer hard-a-port, rushing into the wheelhouse, brushing aside the quartermaster and holding the ship on course. The two ships passed within inches of one another. Any alteration in course would have actually caused a collision. The final stage of Murdoch's career began in May 1911, when he joined the new RMS Olympic, at 45,000 long tons (46,000 t). Intended to outclass the Cunard ships in luxury and size, it needed the most experienced large-liner crew that the White Star Line could find. Captain Edward J. Smith assembled a crew that included Henry Wilde as Chief Officer, Murdoch as First Officer, and Chief Purser Herbert McElroy. On 14 June 1911 Olympic departed on her maiden voyage to New York, arriving there on the 21st. The first indications of what was to come occurred on 20 September when the Olympic had her hull badly damaged in a collision with the Royal Navy cruiser HMS Hawke. Since Murdoch was at his docking-station at the stern during this collision – a highly responsible position – he found himself giving evidence in the inquiry into an incident that turned into a financial disaster for the White Star Line, as the voyage to New York had to be abandoned and the ship taken to Belfast for repairs, which took a good six weeks. It was thus not until 11 December 1911 that Murdoch rejoined the ship. During the time that he served aboard as First Officer (until some time in March, 1912) there were two further – though lesser – incidents, striking a sunken wreck and having to have a broken propeller replaced, and nearly running aground while leaving Belfast. However, upon reaching Southampton, he learned that he had been appointed as Chief Officer of the new Titanic, the Olympic's sister ship and reputedly the largest and most luxurious one afloat. Lightoller later remarked that "three very contented chaps" headed north to Belfast, for he had been appointed First Officer, and their friend Davy Blair was to be the new second officer. Awaiting them would be an old Adriatic hand, Joseph Groves Boxhall, as Fourth Officer, and others who would be familiar colleagues, including the now aging Edward J. Smith as Captain and on the verge of retirement. Murdoch, with an "ordinary master's certificate" and a reputation as a "canny and dependable man", had climbed through the ranks of the White Star Line to become one of its foremost senior officers. Murdoch was originally selected as the Chief Officer for Titanic's maiden voyage. However, the captain, Edward J. Smith, brought Henry Wilde in as his Chief Officer (from a prior assignment), so Murdoch became the First Officer. Charles Lightoller was in turn reduced to Second Officer, and the original Second, David Blair, would not sail with Titanic at all. Murdoch was on the navigation bridge of the Titanic at the time of the collision with the iceberg. At approximately 11:40 pm on 14 April 1912, First Officer Murdoch was in charge when a large iceberg directly in the Titanic's path was sighted. Quartermaster Robert Hichens, who was at the helm, and Fourth Officer Joseph Boxhall, who may or may not have been on the bridge during the collision, both stated that Murdoch gave the order "Hard-a-starboard", a tiller command which would turn the ship to port (left) by moving the tiller to starboard (right). At the time steering instructions on British ships generally followed the way tillers on sailing vessels are operated, with turns in the opposite direction from the commands. As Walter Lord noted in The Night Lives On, this did not fully change to the "steering wheel" system of commands in the same directions as turns until 1924. It has been alleged that Murdoch's orders were misinterpreted by the helmsman, resulting in a turn the wrong way. 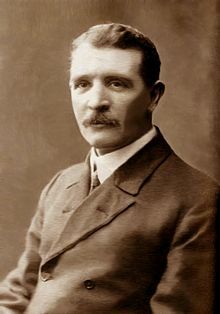 Fourth Officer Boxhall testified that Murdoch set the ship's telegraph to "Full Astern", but Greaser Frederick Scott and Leading Stoker Frederick Barrett testified that the stoking indicators went from "Full" to "Stop". During or right before the collision he may have also given an order (as heard by Quartermaster Alfred Oliver when he walked onto the bridge in the middle of the collision) of "Hard a'port" (moving the tiller all the way to the port (left) side turning the ship to starboard (right)) in what may have been an attempt to swing the remainder (aft section) away from the berg in a common manoeuvre called a "port around" (this could explain his comment to the captain "I intended to port around it"). The fact that such a manoeuvre was executed was supported by other crew members who testified that the stern of the ship never hit the iceberg. The orders that Murdoch gave to avoid the iceberg are debated. According to Oliver, Murdoch ordered the helm "hard to port" to ward off the stern of the iceberg. Hichens and Boxhall made no mention of the order. However, since the stern avoided the iceberg, it is likely that the order was given and carried out. Despite these efforts, the ship made its fatal collision about 37 seconds after the iceberg had been sighted. The starboard side scraped the iceberg, buckling the hull in several places and causing rivets to pop out below the waterline, opening the first five compartments (the forward peak tank, the three forward holds and Boiler Room 6) to the sea. After the collision, Murdoch was put in charge of the starboard evacuation during which he launched ten lifeboats. He was last seen attempting to launch Collapsible Lifeboat A. Murdoch perished in the sinking and his body was never recovered. It is widely rumored that Murdoch had committed suicide in the ship's final moments, by shooting himself with a revolver shortly before the vessel foundered. Several passengers, including Third Class Passenger Eugene Daly and First Class passenger George Rheims, claimed to have seen an officer committing suicide in the ship's final moments, at the forward lifeboat station on the starboard side, where Murdoch was reportedly last seen. Second Officer Lightoller denied the rumors. He testified that he saw Murdoch working to free Collapsible A and was swept into the sea by the wave washing over the boat deck and that "other reports as to the ending are absolutely false". However, Lightoller's testimony at the U.S inquiry suggests that he was not in a position to witness Murdoch being swept into the sea. It is also possible that Lightoller may have wanted to conceal the suicide, if it occurred, from Murdoch's widow. Later in life, Lightoller is said to have admitted that he "knew someone who committed suicide that night" but never named the person. Shortly after the sinking of the Titanic, the New York Herald published a story about Rigel, a dog reportedly owned by Murdoch who saved some of the survivors from the sinking. While the story was widely reproduced, contemporary analyses cast doubt on whether the dog actually existed. The memorial to William Murdoch in Dalbeattie. In Murdoch's hometown of Dalbeattie, Dumfries and Galloway, Scotland, a memorial was created. In 1997, James Cameron donated money to establish a charitable prize in Murdoch's name. Residents, in particular Murdoch's nephew, had criticized Murdoch's portrayal in Cameron's 1997 film Titanic. In April 2012, Premier Exhibitions announced that it had identified Murdoch's belongings from a prior expedition to the wreck of the Titanic in 2000. There was a toiletry kit, a spare White Star Line officer's button, a straight razor, a shoe brush, a smoking pipe, and a pair of long johns. The items were recovered by David Concannon, Ralph White and Anatoly Sagalevitch diving in the Russian submersible Mir 1 in July 2000. The reported incident of Murdoch's suicide was portrayed in the 1996 miniseries and the 1997 film. When Murdoch's nephew Scott saw the film, he objected to his uncle's portrayal as destroying Murdoch's heroic reputation, and film executives later flew to Murdoch's hometown to apologize. However, the film's director, James Cameron, did not see the depiction as negative, saying, "He was overwhelmed by feelings of desperation and makes the ultimate payment by sacrificing his own life." In the film's final scene, which shows the main character Rose dreaming about being on the Titanic, Murdoch is depicted in a heroic fashion, standing next to Thomas Andrews, as Rose enters the Grand Staircase to see Jack. ^ Nathan Robison (12 February 2002). "Hard a-starboard". Encyclopedia Titanica. ^ "Titanic Inquiry Project – United States Senate Inquiry". titanicinquiry.org. ^ "Testimony of Robert Hichens (Quartermaster, SS Titanic)". Titanic Inquiry Project - United States Senate Inquiry. ^ Alleyne, Richard. "Titanic sunk by steering blunder, new book claims". Telegraph.co.uk. Retrieved 27 June 2018. ^ "STOP Command / "Porting Around" Maneuver". marconigraph.com. ^ ""Last Log of the Titanic" -Four Revisionist Theories – a "port around" or S-curve manoeuvre in which "the bow is first turned away from the object, then the helm is shifted (turned the other way) to clear the stern"". Archived from the original on 28 October 2003. Retrieved 12 March 2009. ^ "STOP Command / "Porting Around" Maneuver". marconigraph.com. SENATOR BURTON: Do you not think that if the helm had been hard astarboard the bow would have been up against the berg? QUARTERMASTER GEORGE ROWE: It stands to reason it would, sir, if the helm were hard astarboard. ^ "titanic-model.com, '''Titanic and the Iceberg''' – By Roy Mengot". Titanic-model.com. 14 April 1912. Archived from the original on 20 September 2013. Retrieved 19 September 2013. ^ "The whole impact had lasted only 10 seconds". Pbs.org. 10 April 1912. Retrieved 19 September 2013. ^ a b "Charles Herbert Lightoller- William Murdoch". ^ "Did Murdoch Have a Heroic Dog Named 'Rigel'?". williammurdoch.net. Retrieved 28 March 2018. ^ Maltin & Aston 2011, p. 176. ^ "AP Exclusive: Titanic artifacts linked to officer". The San Diego Union-Tribune. 3 April 2012. Retrieved 24 May 2018. ^ "Nephew angered by tarnishing of Titanic hero". BBC News. 24 January 1998. Retrieved 19 September 2013. ^ "Titanic makers say sorry". BBC News. 15 April 1998. ^ "Murdoch". williammurdoch.net. Retrieved 23 August 2016. Bruce Beveridge (2009). Titanic, the ship magnificent. Volume two: interior design & fitting out. The History Press. p. 509. ISBN 9780752446264. Daniel Allen Butler (2009). The other side of the night: The Carpathia, the Californian and the night the Titanic was lost. Casemate Publishers. p. 254. ISBN 1935149024. Mark Chirnside (2004). The Olympic-class ships : Olympic, Titanic, Britannic. Tempus. p. 349. ISBN 0-7524-2868-3. Maltin, Tim; Aston, Eloise (29 November 2011). 101 Things You Thought You Knew About the Titanic . . . but Didn't!. Penguin. ISBN 978-1-101-55893-5. Retrieved 28 January 2013. Gérard Piouffre (2009). Le " Titanic " ne répond plus (in French). Larousse. p. 317. ISBN 9782035841964. This page is based on the Wikipedia article William McMaster Murdoch; it is used under the Creative Commons Attribution-ShareAlike 3.0 Unported License (CC-BY-SA). You may redistribute it, verbatim or modified, providing that you comply with the terms of the CC-BY-SA.